Unless otherwise indicated, lay the cards horizontally from left to right. RELATIONSHIP SPREAD This is my favorite relationship spread. It applies to any kind of relationship. On the left side, throw three cards that represent you. On the right side, throw three cards that represent your friend. The card in the middle is the advice card as to how you can come together and understand how to have a better relationship. Will the attraction be instant or a gradual awakening? What will this person be like physically? What will this person be like emotionally? When/where/how will I meet this person? What I bring to the relationship. What the other person brings to the relationship. Challenges to the relationship for me. How the relationship will progress. What I am looking for in a partner. General situation between you and your object of desire. How he/she feels about you. How you feel about him/her. Obstacles to a relationship with this person. Outcome/Advice (answer to “Is this person for me? Lay out six cards in an upward diagonal from left to right. 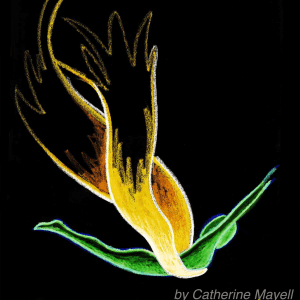 Card 1: Where I am right now in my love journey. Cards 2-5: Lessons I need to learn or steps I need to take to attain love. Anything my loved one wants to say to me. What my child came into life to learn. Where my child is now. What my child needs from me. Where the child is headed over the next ___ (state time frame). What my pet is feeling. What my pet is trying to tell me? What my pet most wants from me. What I can do to help my pet? What is it I don’t like about this person? What is it that this person triggers within me that I have been avoiding? How might this person be a teacher for me? What obstacles are there to my learning? What do I need in order to grow from this relationship? This is your outside appearance; what you know and others can see. This is the unknown; what you’re not aware of, no one can see, but what is ruling. This is the hidden; what you know but won’t show others. This is the blind spot; what you can’t see but what others see in you. What is my lesson right now? How else can I grow spiritually at this time? What’s my biggest challenge at this time? What does the other side have to teach me? Anything else to know about the other side. 1: Quality within me that leads me to inner peace. 2: Obstacle within me to attaining inner peace. 3: If there is any one thing I should be doing to achieve inner peace? 4: Something in my environment that helps or blocks me. 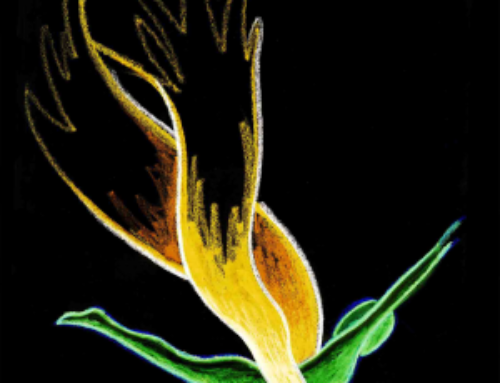 Card 1: Where I am right now in my journey to fulfillment. Card 2-5: Lessons I need to learn to reach fulfillment. What do I need most right now to be happy? What am I focusing on instead? What quality in myself should I develop more? Where am I headed in the short-term? 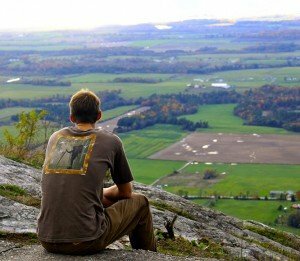 Where am I headed in the long-term? What is the purpose that I was brought here to fulfill? What obstacles do I need to get over? 3 Lessons (lay out 3 cards) I need to learn along the way. Who or what can help me attain my goal? What can I give to the world? How do other people perceive me? What is my shining self? What is my inner most passion? What is hidden within me that is waiting to be discovered? What did you come into this world for this lifetime? What did you come into your specific family for? What is the specific emotion that’s been most difficult for you to learn to use to your advantage this time? What is your biggest challenge this time around? What will be your greatest gift this time? What is your greatest lesson this time? What I am good at doing. Issues in my environment I should know about. The next best step to bring me to my true work. Someone who will help me along the way. What is the lesson here for me regarding money? 1: What is the overall state of my health? 2: What is the overall state of my mind? 3: What is the overall state of my body? 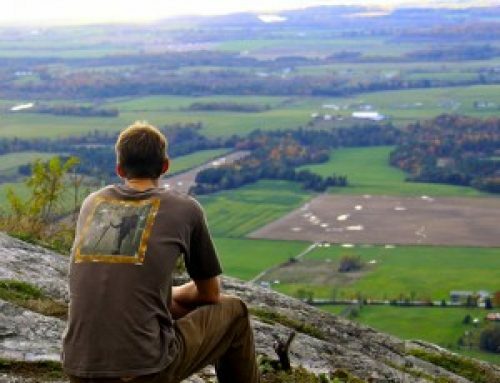 4: What is the overall state of my spirit? 5: How do I integrate these parts of myself? 1: The issue that’s upper most in my mind. 2: Something more to know about it. 3: Obstacle to my focus. 4: What to do about it? How it is best used. What inhibits this power within me? How can I bring it out more? 1. What does this event have in store for me? 2. What do I need to watch out for? 3. What I need to confront. Describe the situation I find myself in. What’s the lesson in it for me? How might I end out benefiting from this situation? Who? Who is involved in the situation? What? What does the situation involve? Why? Why did the event(s) take place? When? When did the events take place? How? How did this event/situation come about? What do I need to progress? Is there a positive help to be asked for? Is there a venue to pursue? What am I finishing now and leaving? Who are my guides for this next journey? What traits can I work on to achieve a more successful outcome? What will be my new learn strengths? What you need to leave behind, to release. Show me a past life. What was my purpose in that life? What what my profession or avocation in that life? What other family members were in that life? Were there other people from this life in that life? Write your yes-no question down. Remove the Wheel of Fortune from the deck and place it before you face up. Shuffle the rest of the deck, with your mind on the problem. Spread the cards in a fan, face down. With your left hand, draw seven cards at random. Put them face down on top of the Wheel. Set the remaining deck aside. Turn the Wheel of Fortune face down like the other seven cards. Shuffle these eight cards until you no longer know where the Wheel is. 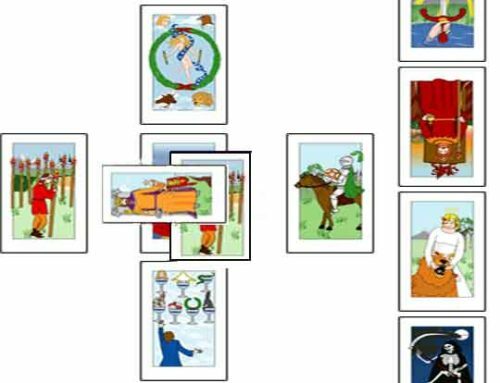 Top Left: The 1st position (cards 1 & 5) signifies – YES. 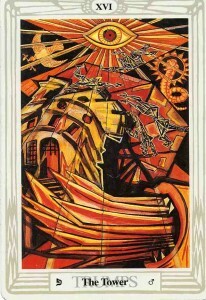 Top Right: The 2nd position (cards 2 & 6) signifies – SOON. Bottom Left: The 3rd position (cards 3 & 7) signifies – DELAY. Bottom Right: The 4th position (cards 4 & 8) signifies – NO. WHO AM I? (Or WHO ARE YOU or WHO IS S(HE)? This is my inner most self. This is my personality or outward self. This is a challenging aspect of myself (an aspect that is troubling). This is aspect of myself I wish to develop further. Thank you so much for this, I did the future love spread, and am confused about a couple of things. When I asked where I’ll meet this person, I got 10 of cups. 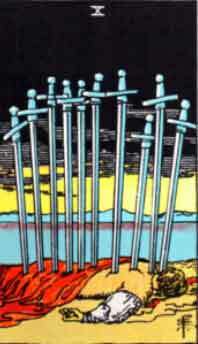 And when I asked how I’ll meet this person, I got 8 of swords. Can someone please help me interpret this? It depends on the deck you used. 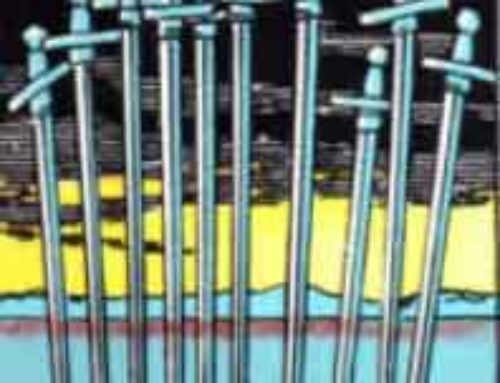 10 cups and 8 swords vary widely by deck. what is delay or soon equivalent to if the answer has nothing to do with time? Perhaps you could tell me the question you posed so I can better answer what delay or soon means. Sounds like you are asking about the Yes-No Oracle, right? If the Fortune card appears in the upper left quadrant, which means “soon” then I take it to mean “yes.” If it appears in the third or fourth quadrant, which means “delay” then I assume the answer is no or negative. If the question is “Will I find true love?” Then first quadrant is yes and likely soon. Second quadrant is yes, but some things need to happen first, like you may need to grow a little more. The actual cards that shows up in the four quadrants are helpful hints as to what’s going on around this issue you could explore. If the Fortune card shows up in the third or fourth quandrant, then you’ve got a lot of work to do before true love is coming in. Amazing information. Thank you for putting in so much effort to guide us all with ease. Truly helps to understand the card. Also, the questions added are so detailed. Thank you again. 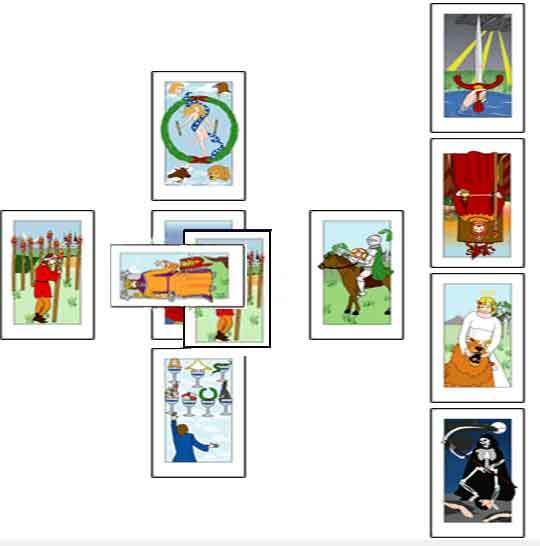 With the Yes-No Oracle spread, do you only read the cards in the position containing the Wheel of Fortune? I read all the cards in the spread. I’ve always wondered what exact question to ask while using these spreads? Or is doing them with the issue in mind generally enough? I’d say it usually seems to be but I was curious if there was someway better? If someone is having trouble making a decision on moving ( like which state) what spreads do you suggest? I sit and focus and quiet my mind. Then I throw a few cards for each possible place. You can vary the questions but here are possibilities for what you might want to know about each place: 1. What is important for me to know about this place for me and my family? 2.How will I/we fare here short-term? 3. Long -term? 4. Challenges I will face here? 5. Overall energy of this place for me. You could also just throw one card for each place, if there are a lot of options. Just be sure to focus on a question when you throw the card. Hello, this site is really great and thanks for making it to help all of us. I think its great that you take the time to answer our questions too, please would you help me? I did your 4 card love on the other side spread, who knows if I did it right? but I spoke the full name of the the deceased person as I shuffled the cards, beforehand I took some breaths and recited at the top about asking a spirit guide for support. I then cut the deck right to left with left hand and put it back together, I then layed out 4 cards in a row left to right. I pulled queen of wands 1st, queen of cups 2nd, king of wands 3rd and 3 of wands 4th. Please could you tell me what this means ? Ps. don’t think I’m crazy etc. but this deceased person is someone who died in the 20th century and I don’t have anything to do with him in this life but I think I knew him in my previous life and have bumped into his reincarnation! Thank-you, Pastor Moses. I’m so glad you like them. I am on the verge of publishing a slightly longer number of spreads, since I’ve found more that I like. So stay tuned. Thank you for these wonderful spreads. 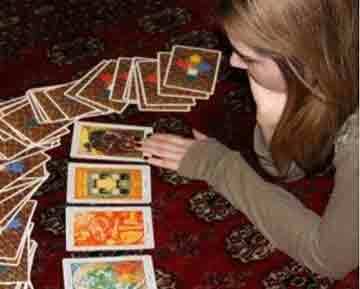 I am an avid tarot learner. I wanted to give your “do this/ don’t do this” spread a try. I had some questions and needed your help too. Do you use reversals for this spread. The reason I ask is because, I tried this for 3 questions. 1. Should I relocate for a job offered to me, I got the Judgement reversed for Do this and 8 of cups for Don’t do this. I didn’t understand what Judgement reversed could mean, my gut feeling told me that Judgement is a new beginning, so in this case maybe not since its reversed. 8 of cups says don’t walk away from what you have. Not sure if I am correct. My next question was should I look for another job in my city. I got Ace of pentacles for Do this and King of Swords for Don’t. Here I interpreted it as yes, look for another job, there is something in the pipeline for me and King of Swords tells me don’t analyse the situation too much, or don’t think too much, just go for it. Am I reading the cards correctly? Another question was should I invest in a property in my native place, I got the King of cups and 8 of cups reversed. I was stuck here, didn’t know what the cards are trying to tell me. Your insight would be appreciated. These are great!! Thanks for sharing. 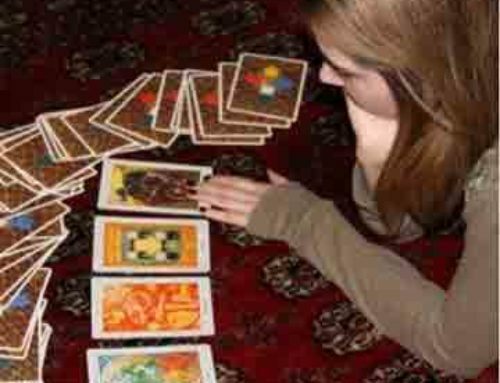 Why don’t you use the traditional 10 card spread for divination? Why do you use the Crowley deck rather than the Waite deck? Thanks for asking these great questions. I use the eleven-card Celtic Cross for nearly all of my readings. I use the shorter spreads in my classes because we read each other as a group and there isn’t time to do a whole Celtic Cross. The shorter spreads are also useful when someone wants to focus on just one area of their life – like future love or finances or their child. Since receiving your comment, I have published a post on the Celtic Cross. Thanks for bringing up the topic! 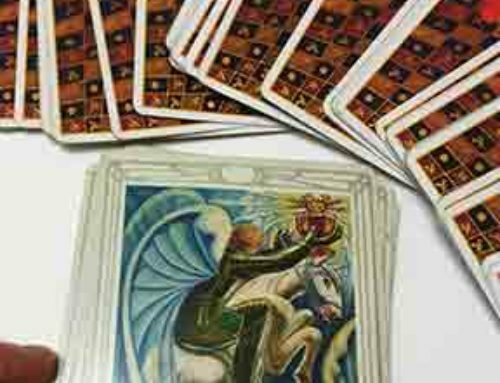 Regarding the Crowley Deck: I prefer the Crowley deck over the Rider Waite because it is both beautifully rendered and very stimulating to the imagination. Aleister Crowley and Frieda Harris spent seven years working on that deck. She sometime made dozens of drafts of each card before they settled on a final painting. Crowley was a brilliant man (even though he was a controversial bad boy of the day and I probably would not have liked the guy had I met him). But he produced a great deck. I also use the the Osho Zen deck as a supplement but rely mostly on Crowley. 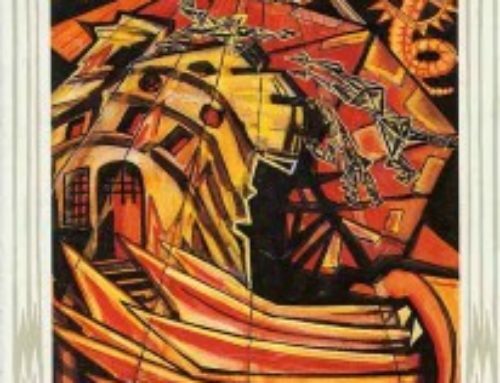 I love the Crowley deck’s use of color and the way it accentuates the four elements of earth, air, fire and water. The Waite deck doesn’t do much for me, but that’s me. I can read it but it doesn’t inspire me the way Harris’s images do. 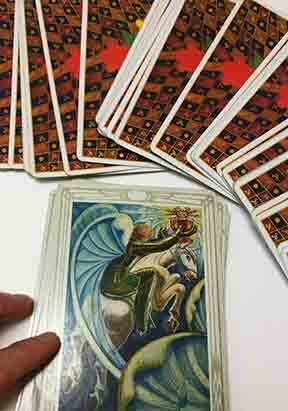 The Waite deck is the most popular deck, probably because its simple tableau images are easy to read. Each card is a little story unfolding. It’s a nice deck, but the Thoth deck is so stimulating that I often see the images coming right off the card and into the air in front of me. I hope that helps to answer your question.